out’ says the third: ‘Hang him up’ says the duke. he hath killed, otherwise he had suffered for’t. Any dog is lucky with such a master. On a rainy Saturday night, the Adelaide University Theatre Guild gave us an uneven but worthy production of this problematic play, that needs some work, There are at least 20 minutes that could be excised to advantage, and to fill in the gap, several in the cast could slow down. A number blurted their lines as though late for a train, or rehearsing a revival of His Girl Friday. Your correspondent is aging and perhaps losing hearing and humour, but we do need some attempt at enunciation. Yes, it’s a comedy but a pretty perverse one: appropriately in this production, the denouement (in a exile wasteland populated by types from Escape From New York) rolls out, a bit like something from Tennessee Williams, in stark terms that pull the audience up short, as well as the brides to be, looking appropriately bereft as the two rivals, now pals again, go off almost like they are a couple. Somehow, it almost works – TVC has seen enough German Opera to be impervious (our coat of hard varnish) to modern revisionism, so we look past the lap tops, mobile phones and post-punk feel – and kudos overall for the attempt, which should improve in the run. Matthew Chapman and Nicholas Clippingdale, in the roles of wronged rival and his servant, were amusing and confident: Lindsay Dunn (the Duke) spoke best among the cast and could well pass as stunt-double for the mid-career Anthony Hopkins; Kate van der Horst was feisty as Silvia. 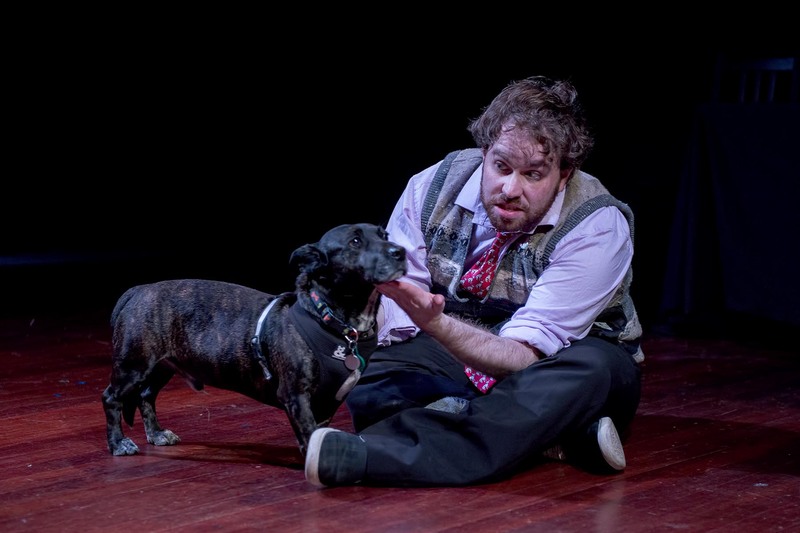 The stand-outs, by unanimous acclaim, were Matt Houston as the servant, Launce (in this production, called ‘Lance’) and Diesel as his canine master. Both should have their own TV show: Houston was an outrageous scene-stealer and the dog was perfect.